Also Called: June berry, downy shadbush. Trunks: Stems erect, solitary or in colonies from suckers; bark gray, initially smooth, eventually furrowed, furrows shallow, ridges long; wood brown, hard. Twigs: Reddish brown, flexible, glabrous; leaf scars crescent-shaped; buds reddish brown, conic, margins ciliate, apex acute to acuminate, terminal buds .4 to .5 inch, lateral buds .04 to .1 inch. Leaves: Deciduous, alternate, simple; petiole .5 to 1 inch; blade ovate to obovate, 1.6 to 3.6 inches long, 1 to 2 inches wide, base cordate to rounded, margins serrate to 2-serrate, apex acute to acuminate, abaxial surface light green, densely lanate initially, sparsely lanate or glabrate later, adaxial surface dark green, glabrous or sparsely hairy later. Flowers: Racemes, terminal from new growth, (3-)6-12(-15)-flowered, .8 to 2.8 inches; peduncles .2 to 1.2 inch, lanate or glabrescent; pedicels .2 to 1.2 inch, lanate. Flowers bisexual, radially symmetric; sepals 5, reflexed after flowering, triangular to lanceolate, .08 to .16 inch; petals 5, white, linear to oblong, .4 to .7 inch long, .1 to .26 inch wide; stamens 16-21; pistils 5; styles 5, connate proximally, .12 to .22 inch; stigma as many as styles. Fruit: April to July; pomes, maroon-purple, globose, .24 to .4 inch diameter, glabrous; sepals persistent; seeds purplish brown, ovoid, granular. Uses: Birds eat the fruits. Native Americans used the berries in soups and stews and dried them for winter use. The fruits and infusions of small branches were given to mothers following childbirth to relieve pain and hemorraging. Comments: With bright white flowers that appear before most other trees leaf out, Amelanchier arborea is often conspicuous on bluffs, ledges, and forested slopes, but it is never abundant in our area. 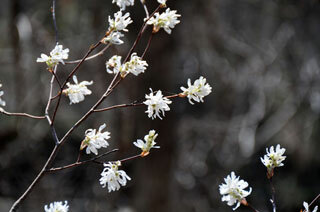 Amelanchier is a French name for a European species. The name shad berry alludes to the flowers appearing about the time that shad ascend streams to spawn.